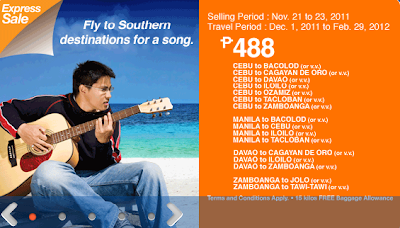 AirPhil Express marks down ticket prices to selected local destinations as it invites you to “Fly to Southern Destinations for a Song”. All ticket prices hits Php 488 with travel period of December 1, 2011 to February 29, 2012. This is a good deal for those who haven't plotted their holiday vacation yet. The sale includes all major key-destinations in the South in the likes of Bacolod, Iloilo, Davao, Tacloban and Zamboanga. Flights are from Manila, Cebu, Davao and Zamboanga. Php 488 is only the base fare, other taxes are excluded but if you try to book online that would hit the Php 800-900 range. Check out details after the jump. Express sale is up until November 23, 2012. Seats can be booked online through their website or to any of AirPhil Express ticketing centers nationwide. Queries are entertained through these numbers. This Article helped a lot? Please +1 us on Google and SEND it to your Facebook friends by clicking the buttons below.